Potassium is an essential macromineral in human nutrition with a wide range of roles, including transmission of nerve impulses, contraction of heart (blood pressure) and skeletal muscles, and production of energy. Potassium is the predominant electrolyte within cells and essential for maintaining proper cellular tonicity. Potassium is necessary for the heart, kidneys, and other organs to work normally. Low potassium is associated with a risk of high blood pressure, heart disease, stroke, arthritis, cancer, digestive disorders, and infertility. The citrate salt of potassium has been shown to aid in the preservation of skeletal integrity. In this respect, it may function by partially neutralizing the high acid loads associated with typical Western diets to help prevent the excessive loss of calcium. A study in the journal “Nature Neuroscience” investigated the role of potassium in the regulation of serotonin, the neurotransmitter primarily targeted by antidepressants. The researchers speculated that potassium channels in the brain may play an important role in serotonin regulation. Potassium appears to act as a facilitator in ensuring the brain’s ability to properly utilize serotonin. Depression is often characterized by negative thoughts such as guilt, feelings of helplessness and hopelessness, low self-worth, and suicide. Potassium is required to activate neurons involved in positive thoughts and feelings. Without the electrical charge sparked by potassium, neurotransmitters like serotonin cannot be utilized to make us feel better. This may explain why even a slight decrease in potassium levels can result in significant feelings of anxiety. Take 1-4 tablets per day or as directed by your qualified healthcare professional. Calcium phosphate, cellulose, stearic acid (vegetable source), magnesium stearate (vegetable source), silicon dioxide and a food grade coating. 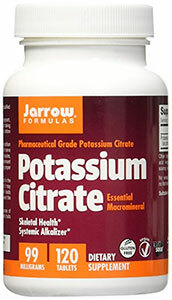 consult a nutritionist on the proper dosage of potassium citrate. Have cardiovascular concerns such as high cholesterol, high blood pressure and abnormal heart rhythm. The FDA has determined that foods that contain at least 350 milligrams of potassium can bear the following label: "Diets containing foods that are good sources of potassium and low in sodium may reduce the risk of high blood pressure and stroke."